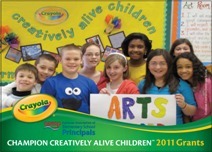 Strengthen arts education in your school with a 2011 grant to Champion Creatively Alive Children, a national program funded by Crayola and supported by NAESP’s National Principals Resource Center. Crayola will award up to 20 grants to help educators explore the “what if” opportunities in arts education that lead to innovative best practices that can inspire other educators nationwide. The grants, which include a $2,500 monetary award and $500 worth of Crayola products, are specifically aimed at helping NAESP members implement and document innovative arts-education projects to share best practices and innovative approaches to nurturing creatively alive children. The deadline for submitting an RFP is midnight, Friday, July 8, Friday, July 15, 2011.